Mir Taher Mousavi, a Former MP, a university instructor, and a member of Mir Hossein Mousavi’s 2009 presidential campaign, has been sentenced to three years imprisonment plus two years suspended sentence. Mir Taher Mousavi, former governor of Karaj, former Vice President of the National Security and Foreign Policy Commission, former CEO of Kahrizak Hospice Charity and the founder of it’s second branch in Mohamad Shahr Karaj, Social Welfare and Rehabilitation Sciences University instructor, and coordination assistant of Mir Hossein Mousavi’s 2009 presidential campaign has been sentenced by the Appeals Court. Mir Taher Mousavi was previously sentenced by Branch 26 of the Revolutionary Court to 5 years imprisonment to be served in Sistan and Balouchestan province, plus 10 years exile in the same province on charges of anti-national security acts through assembly and collusion. Branch 54 of the Court of Appeals has now reduced his sentence to 3 years imprisonment plus 2 years suspended sentence. Mir Taher Mousavi was arrested last year at Imam Khomeini International airport when returning to Iran from a family trip abroad. For many months he was incarcerated in solitary confinement at Ward 209 of Evin prison (the Intelligence Ministry’s ward) under heavy pressure and severe physical and psychological torture. Mir Taher Mousavi suffers from various illness and a heart condition and was under physicians care prior to arrest. His medical records were given to his interrogators by his family but not only they did not provide proper medical care but kept him in solitary confinement for 8 months before transferring him to the General Ward 350 in Evin prison. On Tuesday June 18, Gita Rezaei was arrested by agents when boarding a plane to Tehran at Kermanshah’s Ahsrafi Esfahani airport and taken to an undisclosed location. Human rights activist, Taghi Mahmoudi, told HARANA that agents went to her home on the night of her arrest, and, after searching the house, they confiscated her computer and personal and work related items. Gita Rezaei is a software engineer and worked at a company providing immigration services. Until Wednesday June 27, when they permitted Gita to have a short phone call with her family, they had no information about her status or whereabouts. On Thursday June 20, incarcerated labor activist Afshin Osanlo was taken to a hospital after he suffered a heart attack in Rejaei Shahr prison . Unfortunately he did not survive his heart attack. Director of Tehran’s prisons in an interview with ISNA confirmed Afshin Osanlo’s death and said, Osanlo was arrested in 2010 and was to be released next February but, unfortunately he died due of a heart attack at Shahid Rejaei’s hospital in Karaj. 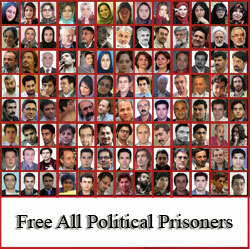 Several other political prisoners have lost their lives in the past in the prison system due to harsh prison conditions and negligence of prison officials. Afshin Ossanlu was the brother of former political prisoner Mansour Osalo, the founder of the Vahed Syndicate (bus drivers union). Afshin Osanlo was tried and convicted by Judge Salavti and sentenced to 5 years imprisonment on charges of “assembly and collusion” based on passengers’ testimony and for holding a passport. His sentence was upheld by the Appeals Court. Afshin’s brother Mansour Osanlo wrote on his Facebook: “They arrested Afshin in the sleeping quarters of the drivers for the South Terminal. They took him to the Intelligence Ministry’s office in Shahr-e-Ray, and, after coordinating with the Intelligence agents at Evin, they transported him to Ward 209. There, he was under the most severe tortures in order to force a confession from him against the union and union activities. Afshin Osanlo was arrested in the fall of 2010 and was incarcerated for four months in Ward 209 of Evin prison under severe torture, and the injuries he suffered under torture were still evident on his body prior to his death. Repeated blows to his body with a cable had caused a tear in his foot and a tumor in his scapula. “Jaras” conducted an interview with Osanlo’s sister after the news of his death was published. This interview was conducted while the sound of Afshin’s mother wailing and screaming could be heard in the background. Mrs. Osanlo ,with our condolences, would you please tell us the circumstances of your brother’s death. We’re just in a shock, we still can’t believe it, we heard about it through friends. After you heard the news did you go to the hospital or the prison? Yes, today I went to Rejaei Shahr (prison) to find out if the news is true. They told me to go to court and get a permission to see Afshin’s body. After that I went to the nurse, she said Afshin was moved to Rejai Hospital Thursday eight o’clock at night, but he had already passed away. You mean he died in prison? I wanted to know that also, and I questioned them about the cause of my brother’s death. They said he was dead on arrival but because he was young they were hopeful and tried to resuscitate him for an hour to no avail. They said a heart attack. Today is Saturday, have any of the prison officials contacted you since Thursday to give you the news of his death? No, Afshin has been dead for two days but no one was willing to contact us. Were you able to see his body? Yes…..(she then started to cry), we just can’t believe that Afshin is gone, he was healthy, very healty. When was the last time you had a visit with Afshin? Last week my mother had a face to face meeting with him, he was fine and even hopeful that he might be able to obtain permission for a furlough. How long had he been incarcerated and how long since he had been on a furlough? He was under a five year sentence, and he had been in prison for three and a half years. We were happy that he only had about a year and some months left from his sentence. We had no idea that he would lose his life in prison. He had not committed any crime and was innocent and was unjustly incarcerated. What are the conditions of Rejaei Shahr? He was in Rejaei Shahr for 3 1/2 years, needless to say that everyone knows the conditions of Rejaei Shahr. My mother has been ill and we were occupied with many things. Three and a half years in prison, under harsh conditions, may be easy to talk about but unless one has been there and experienced the situation, one can not comprehend the hardships these prisoners endure. I only have to say that none of the prison officials respected or valued his family enough to contact us and give us the news of his death. What else can I say? I am not feeling well, I can’t talk anymore.